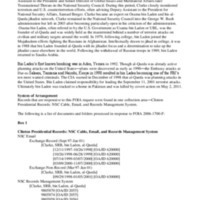 This collection consists of records dated March 3, 1997 to January 20, 2001 between Richard Clarke, Samuel Berger, and the President referring to Osama bin Laden, al-Qaeda, Pakistan, Afghanistan, or the Taliban. The collection contains unclassified emails related to meetings or drafting public guidance. It also includes administrative materials related to document handling and tracking. Samuel Berger did not use email and therefore email correspondence is from Clarke to subordinates of Samuel Berger, and typically carry the instruction “FOR SRB.” Memorandum for the President would pass from Clarke through Berger to the President. It should be noted that because of sensitivities associated with counterterrorism activities and discussion related to Osama bin Laden this collection still remains largely classified.